As we've seen with the Gerrymander, it seems that words coined in relation to politics have incredible staying power, especially when describing things that politicians continue to do. Associating an image with a word, as is done with political cartoons, also helps to cement it in people's minds. It also helps a great deal if the word refers to a particular well-known person. Such is the case with another political buzzword, McCarthyism. While for some the word only brings to mind a particular time and place, it's still used by many today to describe certain undesirable political tactics. It generally refers to a political attack or character assassination of a political rival by means of wild, unsubstantiated claims about them. The man who lent his name to the word was Republican senator Joseph McCarthy of Wisconsin, who in the 1950s claimed to have an extensive list of people in the US government who were communist infiltrators. This led to large scale investigations of his claim, which never bore any fruit, and McCarthy never revealed any of the names he claimed were on his list. This ultimately led to his being officially condemned by a large majority of the Senate. The man who coined the word, and who was one of McCarthy's most vocal critics, was political cartoonist Herbert Block, who generally signed his name "Herblock." 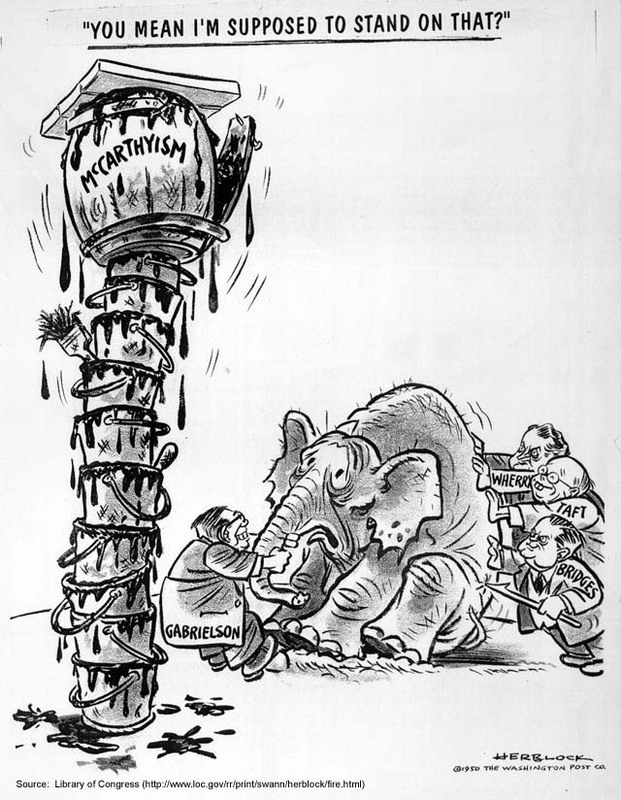 The word first appeared in one of Block's cartoons as a label for a large bucket of tar sitting atop several smaller buckets, which the Republican elephant is being coerced into standing on. Block had been critical of McCarthy previously, and would continue to be so afterwards, but this was the only time that he would ever use the word, at least in a cartoon. This is because, interestingly, Herblock himself never saw anything special about it. He downplayed the status of the cartoon and the word by saying there was "nothing particularly ingenious" about it, and that he "had no thought of creating a new term," but that there was simply no better word to describe what was going on. Still, the word quickly became popular and widely used to describe not only McCarthy but also those who supported him. McCarthy personally condemned Block for the cartoon, and even accused the State Department, the department that he insisted contained the highest number of Communist infiltrators, of paying Block, and called him a "man who is actively committed to oppose attempts to drive Communists out of government." It was true that Block created a pamphlet of cartoons for the State Department, but they were all anti-Communist, and neither he nor the Washington Post ever received compensation for it. McCarthy and his supporters tried to take back the word, and used it to refer to those with a particular brand of patriotism. McCarthy even used it in the title of his autobiography. These days, however, it's mostly used in a negative sense, which may be another part of its staying power: people don't tend to forget a good insult.